Welcome to Dude Said, Punk Said – a special series devoted to skewering the automotive ramblings of young punk Nick Tragianis with the infinite wisdom of old dude Brian Harper. This week, the duo offer their two cents on two freshly redesigned heavyweights in the compact car world – the 2016 Honda Civic and 2017 Hyundai Elantra. Brian Harper: Although it might seem as though crossovers and sport-utes have taken over the world, it’s compact sedans that still rule the Canadian marketplace — for now, at least. Last year, more than 350,000 of these ever-popular cars were sold in our country. The king of the hill in this segment has, for the past 18 years, been the Honda Civic. 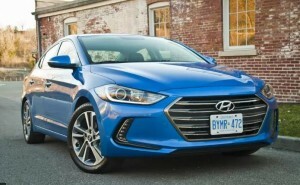 And for the last five years, it’s been Hyundai’s ever-improving Elantra nipping at its heels. So, what we have here is a potential epic battle between two alpha dogs — the 2016 Civic, reigning Canadian Car of the Year, versus the redesigned 2017 Elantra. So, kid, does the Elantra have a chance of knocking the Civic off its lofty perch? Learn more about the All New 2017 Hyundai Elantra on the Milton Hyundai website.Visit the Driving.ca website by clicking the link below to watch the video comparison. Nick Tragianis: If you asked me last year – before the Civic was redesigned – my answer would’ve been different. No other compact car has evolved from a forgettable also-ran into a class leader more than the Elantra. The new one takes that formula and improves upon it considerably – it’s ridiculously well equipped, it’s stylish and, like the Mazda3, it feels like a much more substantial car. But this year, the Civic we knew and loved is back. Not that it went anywhere; it’s been Canada’s best-selling compact car for the past 18 years. Still, it’s been something of an appliance since 2006. Not so much after this year’s redesign, though. It has a new look that may take a bit of getting used to – I’m still iffy on the rear end, although it’s growing on me – but the big news is what’s under the skin. Not only is the platform all-new, it’s got a very sweet turbo-four under the hood. For a compact car, it has some serious spring in its step. Visit the Driving.ca website to watch the video comparison, and use the form below to book a test drive!